Tuesday the 24th of September was Heritage Day in South Africa, a day meant to reflect on and celebrate our coming together as a nation from such a rich diversity of cultures and ethnic groupings. A few of us involved in local organic church groups used the public holiday to facilitate a half-day of fellowship and teaching. In hindsight I think we reflected the spirit of the holiday, also in the context of our biblical inheritance in Christ. Please use your imagination as I try to sketch a personal snapshot of the gathering. 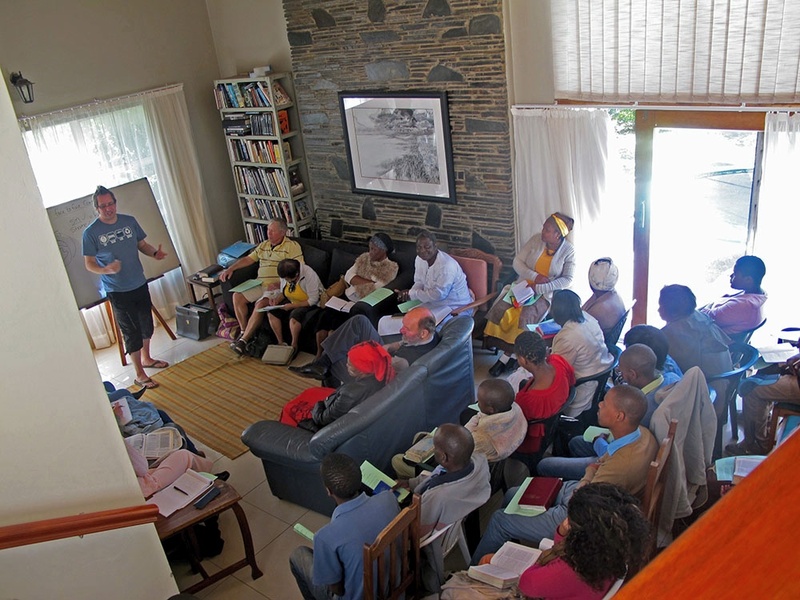 We came together in the Hattingh’s more than spacious home in Summerstrand from mid-day to about 4 pm. People came from all over the Metro, from suburbs and townships alike – I estimate about 50 adults from at least 5 culture/ethnic groups, from middle-income people to the poorest of the poor. The gathering probably represented the demographics of our nation. Being predominantly a day of teaching (Eph. 4:10-13), the teens and adults gathered in the lounge and adjoining dining room while the 15 or so younger children ‘had a ball’ outside in the spacious and sunny garden. After a simple lunch of hotdogs, Justin, Marthinus and I unpacked Frank Viola’s definition of organic church, viz. 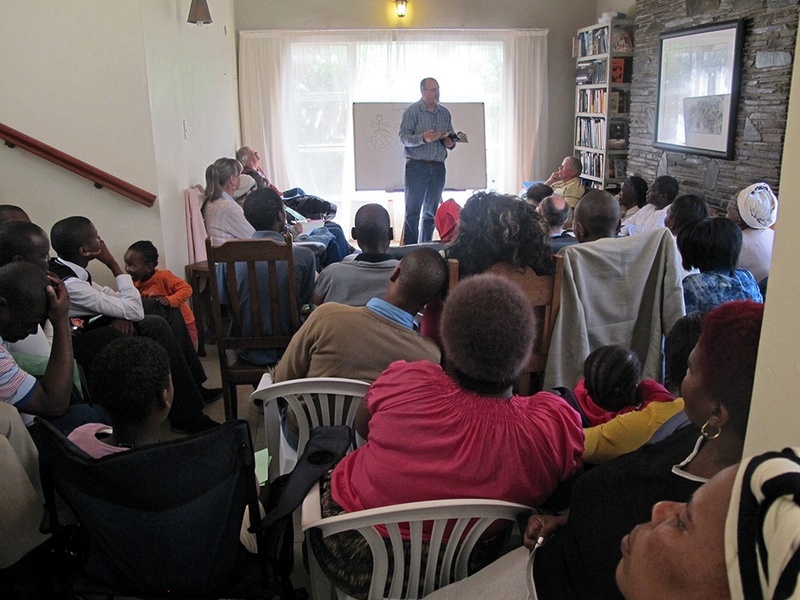 ‘a church that is born out of spiritual life instead of being constructed by human institutions and held together by religious programs… a grassroots experience that is marked by face-to-face community (Justin), every-member functioning (Marthinus), open participatory meetings (as opposed to pastor-to-pew services), non-hierarchical leadership, and the centrality of Jesus Christ as the functional leader and Head of the gathering” (Erroll). Justin shared his experience of Christ’s dying not only for the forgiveness of our sins but also for the setting aside of our shame, focussing on Gen.1ff as well as other relevant scriptures (there was a warm response to this theme, exposing a great need for ‘shame-less’ living and participation in the body on the basis of the Cross). 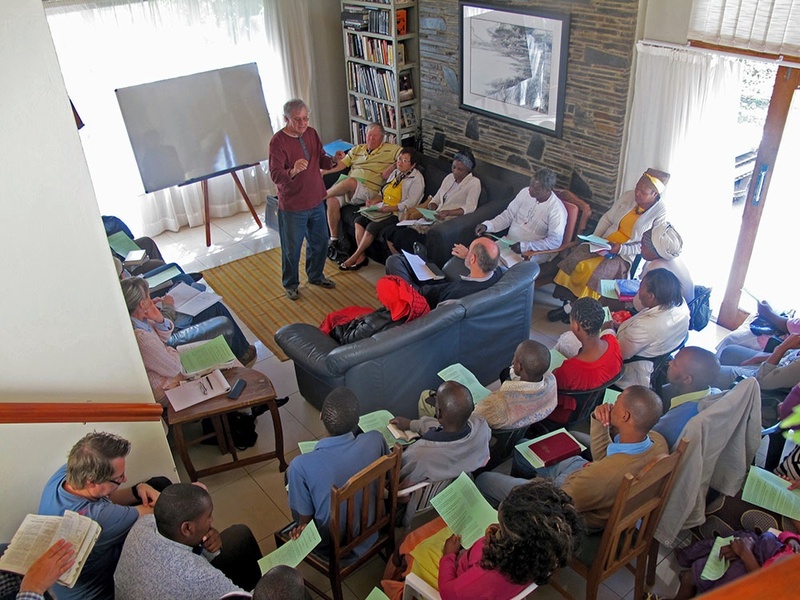 Marthinus shared from his experience of Eph. 4:10ff where gifted leaders come alongside the body with the sole purpose of preparing each member for works of service and mutual maturation in order to incarnate the whole measure of Christ’s fullness. Erroll explained from Col. 1 Christ’s headship over all of creation and his body, pointing out that it is easy to ‘say’ Jesus is head of the church but it’s another thing to let him function as such in our gatherings. View the relatively few (lest we stereotype!) NT snapshots of the church in action: Acts 2:42ff, 1 Cor. 14:26ff, Col. 3:15ff and Heb. 10:19ff. How does your/my community compare?? All in all, there was a lovely sense of Christ’s presence – one of my parting glimpses was of a minibus packed full of believers, singing loudly and exhuberantly the praises of Jesus, on their way home to their RDP homes and shacks. Let me humbly venture a prediction for those engaged in organic church ministry locally, nationally and abroad: most interest will come from the struggling middle class downward to the poorest of the poor. While many were invited to our fellowship day, it was predominantly middle class and poorer folk who responded. This is in line with biblical revelation: read again the gospel accounts of Jesus’ incarnation and earthly ministry, his mission statement in Lk. 4:18ff, his NT ethic in the Sermon on the Mount (Mt. 5-7), the story of the Early Church in Acts and the Apostolic Letters (1 Cor. 1:26-31). Let me quote Jam. 2:5ff (MSG) (‘Favouritism Forbidden’), “Listen, dear friends. Isn’t it clear by now that God operates quite differently? He chose the world’s down-and-out as the kingdom’s first citizens, with full rights and privileges. This kingdom is promised to anyone who loves God…” Generally speaking (I know many wonderful exceptions), the upwardly mobile, both black and white, are too complacent and comfortable in their religious ideas and pursuits to become involved in what is, after-all (like all revivals? ), a grassroots movement. I recall my missionary friend and mentor, David Mniki, a black Transkeian who with his family suffered much under apartheid, making a shocking reply to the question of a fellow disadvantaged black young man who asked how we may empower the poor in Africa. He said, ‘Poverty is a blessing rather than a curse.’ I feel it in my bones that that statement will not sit well with many of us – at least let’s consider whence it came and David’s massively influential life and ministry nationally and abroad. And no, it is not a sin to be industrious, disciplined, well-off or even rich! With warm greetings in Jesus! It’s vital that we watch the first part of the ‘movie’ to get the whole picture, so for those who have not, would you glance at my previous blog, ZECHARIAH’S WINDOWS? Thank you. There are denominational walls, walls between church members (e.g. rich and poor, old and young), walls between believers and non-believers (I often witnessed believers not so subtly sliding along the pew when a smelly street bum joined them). As noted in my earlier blog, the God of the Bible is in the business of breaking down walls. God called the early Church to be wall-breakers, which she (including some of the apostles) resisted for quite a while. In fact the daughter Church at Antioch (in Syria) had to teach the ‘mother church’ in Jerusalem a few lessons of note: Acts 11:19ff, “Meanwhile the believers who had fled from Jerusalem during the persecution after Stephen’s death travelled as far as Phoenicia, Cyprus, and Antioch of Syria. They preached the Good News, but only to Jews. However, some of the believers who went to Antioch began preaching to the Gentiles about the Lord Jesus. The power of the Lord was upon them, and large numbers of these Gentiles believed and turned to the Lord.’ The end-results were the wonderful missionary journeys and church-plants of the Apostle Paul and his co-workers (Acts 13ff). Witness the failure (largely) of denominational, institutional churches to obey the Great Commission (Mt. 28:16ff) and the Great Commandment (Mt. 22:34ff). Witness the failure, in many places, by life and lip to gossip ‘the Good News of the kingdom’ (both terms need fresh scrutiny). In close on 50 years of ministry I have observed churches of all kinds so busy with themselves, constitutions, laws, rules, traditions (yes, Charismatic churches have them too) and controls – to the extent that there is little time and energy left to actually live the Christian life and extend Christ’s kingdom among the poor and captive (Lk. 4:14-21). In fact around the world many sincere believers are leaving institutional churches for their spiritual survival. A middle-aged Christian mother, working in a local Muslim pre-school. She is hugely popular among the children, staff and parents, who know about her faith. She impacts them daily by her character, life-style, wisdom and prayer-life. An eighty-year old granny, who for many years prayed that someone from Sudan would visit South Africa, be equipped, and return to his country to share the Good News. I have a photograph depicting her and a Sudanese teacher who visited our city with the desired result. In fact a few years ago he was our guest-speaker at our annual world missions conference! G. Miller once said, ‘Peter and Paul changed the world by starting small churches in godless towns.’ Can you and I not do the same, starting in our home or someone else’s? Its being done by ‘ordinary people’ all over the world. I really hope you have not found this blog discouraging! I hope not. I am not discouraged. God’s encouragement of Zerubbabel (one of the temple re-builders) is timeless: 4:6ff (MSG), “‘You can’t force these things. They only come about through my Spirit,’ says GOD-of-the-Angel-Armies. ‘So, big mountain, who do you think you are? Next to Zerubbabel you’re nothing but a molehill. He’ll proceed to put the Cornerstone in place, accompanied by cheers: Yes! Yes! Do it!’… Does anyone dare despise this day of small beginnings? '” When Jesus engaged with his disciples in Caesarea Philippi and had Peter identify him as ‘the Christ, the Messiah, the Son of the living God,’ he boldly declared, ‘This is the rock on which I will put together my church, a church so expansive with energy that not even the gates of hell will be able to keep it out’ (Mt. 16:13ff, MSG). Despite the terrible persecutions of Chairman Mao and the withdrawal of all the missionaries, God has grown his Church in China in more recent times from a few million believers to the present-day 100+ million plus, most often through small ‘house churches’ without any clergy. In this knowledge, be blessed! Recently I’ve been dipping into the earlier chapters of Zechariah’s prophecy. Zechariah is one of the ‘minor prophets,’ i.e. those writers of the shorter OT prophecies [many years ago, while preaching from one of the minor prophets, a little girl in the congregation sized up my shorter stature and whispered to her mother, ‘Mom, uncle Erroll must be a minor prophet’]. Zechariah prophesied on Judah’s return to Jerusalem from exile in Babylon, c. 530 BC. He urges the faithful to restore God’s temple in their midst with an eye to the present and the future (of which Zechariah probably understood precious little), no matter the frightening threats of the pagan nations surrounding God’s city. Now if his contemporary Haggai was the ‘builder’ responsible for re-building the temple, Zechariah was the ‘artist,’ ‘adding colourful windows with their symbolism, gaiety and light’ (Joyce G. Baldwin). He is given the help of an angel as a guide to some of these ‘windows.’ These windows shed light on the nation’s immediate context, as well as God’s greater purpose for his people way beyond it. Zechariah also speaks to the nation’s identity as the descendants of Abraham, Moses and David. The nations had treated God’s chosen with contempt and wreaked destruction on them, but God’s long-term purpose for his people remained, viz. to display his glory to Israel as well as the unbelieving nations. God’s people had a history of turning away from him and his law – Zechariah calls them to repent and fulfill their destiny as a nation (cf. 1 Pet. 2:4-12 for our collective identity and calling). We know of course from the OT, especially Isaiah, that God had previously and repeatedly called his people to be ‘a light to the nations.’ From the NT we know that God, in view of Israel’s spectacular failure, chose to send ‘a new Israel,’ viz. Jesus and his Church (Gal. 3:29, 6:16; Rom. 9:6; Phil. 3:3), to fulfill his saving purposes in the earth – this is where you and I come in. Eugene Peterson reminds us that Zechariah’s enigmatic visions, working at multiple levels, and his poetically charged messages are at work still (my italics), like time capsules in the lives of God’s people, continuing to release insight and hope and clarity for the people whom God is using to work out his purposes in a world that has no language for God and the purposes of God. For me there is a great revelation here: God has always wanted to build A CITY WITHOUT WALLS! British scholar J.B. Taylor has pointed out that the period of Ezra-Nehemiah c. 444 BC moulded Judaism into a religion of exclusiveness from which it has never been released – he adds a warning that ‘walls can imprison those within, as well as keep others out.’ He challenges us: are we in danger of building walls around God? Whereas mankind has always been in the business of building walls, the living God of the Bible is in the business of breaking down walls. Is that not precisely why God came in Christ? (read Eph. 2:11-22 for a picture of God’s ‘holy temple in the Lord’). Is that not precisely why he has called you and me to himself? Sadly the Church of Jesus Christ, more often than not, has been in the wall-construction business rather than the wall-demolition business. From this we must repent. Fortunately many are beginning to do just that in these frightening but exciting days – ‘Shh!… Something’s afoot in his holy house. He’s on the move!’ A while ago, while visiting someone in hospital, I saw a young woman wearing a t-shirt bearing the logo, ‘The Church Has Left the Building!’ I almost ran up and kissed her. Occasionally I visit a leaders’ network evening-gathering in Bluewater Bay, which lies at the northern-eastern end of Algoa Bay, home to Port Elizabeth. The double carriage way runs along the beach front, and one of my delights is, going and returning, to cast an eye on the many, many ships lying off Coega Harbour. The ships are beautifully lit up, look warm and inviting, and they make up every kind and size. The fleet at anchor is obviously made up of local ships as well as craft from every corner of the earth. They come to re-fuel, re-plenish, off-load their cargo and take on new cargo destined for distant ports. A word about the harbour. To me, in a way, this represents the Church, the community of Jesus Christ. It’s a place of communion, nourishment, edification and encouragement [ideally the Church at large is made up of so many smaller grassroots communities living out the life of Jesus – pardon the mixed metaphors!]. The ships? Ships take shelter and are replenished in the harbour, but they are not meant to stay there – those that do, soon turn into rusting hulks cluttering up the harbour. Ships are built for the open sea. I have never quite grasped why so many modern yacht clubs degenerate into drinking holes filled with people who never actually go yachting and know nothing about the sea. Fishing boats permanently moored in the harbour are a total contradiction. Ships are meant to carry cargo to other places where there is need of food, fuel or whatever. The cargo we as ‘vessels’ carry is Jesus himself and the ‘Good News’ of the kingdom. Yes, we may carry that precious cargo in ‘jars of clay’ (oops, mixed metaphors! ), as the apostle Paul indicates in 2 Cor. 4, but indwelt by the risen Christ those vessels are incredibly effective and life-transforming. The benefits of the cargo on arrival are not in human hands but in the hands of the Creator and Redeemer, which is comforting! Viola concludes that churches are local, whereas the work is transient. The churches are settled. The work is a roving association. At the end of the day, apostolic workers (church-planters, etc) are not settlers but travellers. Viola, like many others, pleads for the re-introduction of the NT church-planter in the establishment of the kingdom. If I had properly grasped this truth earlier in my ‘pastoral ministry,’ I think I would have done things differently. It is unbiblical and dangerous to try and do evangelism (the bulk of it) in the local church – we tried this as a ‘cell church’ with initial but waning success. 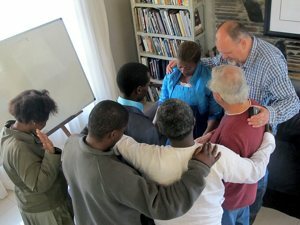 Rather, I believe, the church/fellowship is the place of teaching and encouragement and equipping (Acts 2:42) (with the corresponding gifts operating), while each believer is called to incarnate Jesus in the world: in his or her home, neighbourhood, marketplace, ‘mission field.’ God of course will also sovereignly gift and call out persons and families as cross-cultural church-planters both locally and to the ends of the earth.